We’ve made it through 2017. The first-season installment of presidential Tweetville is ending where it began, on the Palm Beach, Fla., golf course of Mar-a-Lago. Though we are no longer privy to all the footage behind the big white truck, we do know that, given the doubling of its membership fees, others on the course will have higher stakes in the 2018 influence game. The billionaire who ran on an anti-establishment platform went on a swamp-filling, deregulatory and inequality-producing tear, in the process creating the wealthiest Cabinet in modern United States history and expanding his own empire along the way. His offspring, Russia-related investigations aside, didn’t do too shabbily either. White House policy adviser Ivanka Trump’s brand opened a splashy new store in the lobby of Trump Tower in Manhattan, just in time for Christmas. If you look at the stock and asset markets, as Donald Trump tends to do (and as Barack Obama did, too), you’d think all is fine with the world. The Dow Jones Industrial Average rose about 24 percent this year. 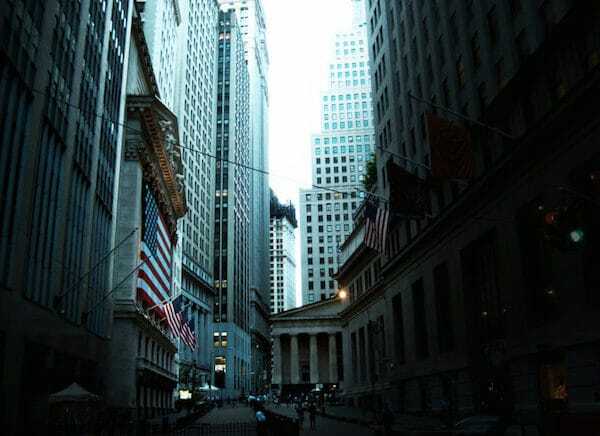 The Dow Jones U.S. Real Estate Index rose 6.20 percent. The price of one Bitcoin rose about 1,646 percent. Those of us living in the actual world without billionaire family pedigrees possess a healthy dose of skepticism over the “Make America Great Again” sect that believes Trump has transformed America “hugely,” for record-setting markets don’t imply economic stability, nor do 40 percent corporate tax cuts translate into 40 percent wage growth. We can march forward into 2018 carrying that knowledge with us. But first, a recap. For the U.S. financial system, 2017 was marked by five main themes: The GOP’s “You All Just Got a Lot Richer” Corporate Tax Reduction Plan; Big Banks Still Bad; The Fed’s Minor Policy Shift; Debt; and Deregulators Appointed to Positions of Regulatory Authority. The Big Six banks have paid billions of dollars in settlements for a variety of frauds committed before and since the 2007-2008 financial crisis, but that didn’t keep them from tallying up new fines in 2017. The nation’s largest bank, JPMorgan Chase, agreed to pay $53 million in fines for scamming African-American and Latino mortgage borrowers with disproportionately higher rates than for white borrowers. The Consumer Financial Protection Bureau fined Citigroup $28.8 million for not disclosing foreclosure-avoiding actions. Bank of America got fined $45 million for its foul treatment of a California couple trying to save their home. But the Big Six bank that received the most attention in 2017, as it did in 2016, was Wells Fargo. The number of people affected by its fake-account creation scandal grew from 2 million reported in 2016 to about 3.5 million. That increase resulted in Wells Fargo expanding its associated class-action settlement to $142 million. Wells Fargo was mired in smaller scandals, too. For instance, it charged 800,000 customers for auto insurance they didn’t need, raised mortgage rates for certain customers without properly disclosing it was going to, and made a bunch of unauthorized adjustments to people’s mortgages. The idea of reinstating the Glass-Steagall Act of 1933 featured in both the Democratic and the Republican National Committees’ platforms during the campaign season. But Trump’s treasury secretary, Steven Mnuchin, made it clear multiple times there would be no such push from the administration, arguing against doing so before senators including Elizabeth Warren and Bernie Sanders. To emphasize his disdain for regulation and oversight, Mnuchin also pushed the Financial Stability Oversight Council, over which he presides, to vote 6 to 3 to rescind American International Group’s designation as posing a potential threat to the U.S. financial system. Thus, AIG will no longer be paying penance for its role at the epicenter of the last financial crisis by filing regular risk reports anymore. Federal Reserve Chair Janet Yellen also supported the move. In a major blow to citizen security, Richard Cordray, the Obama-appointed regulator, resigned as director of the Consumer Financial Protection Bureau in November. During his six years at the helm of the CFPB, which the Dodd-Frank Act formed in 2011, the 1,600-person regulatory entity accomplished a lot. It has provided $11.9 billion in relief to consumers for enforcement actions affecting more than 29.1 million people, handled 1.2 million consumer complaints and garnered timely responses on concerns for 97 percent of consumers. Over at the Office of the Comptroller of the Currency (OCC), Joseph Otting, Mnuchin’s former partner in the takeover of IndyMac and subsequent flurry of foreclosures, was confirmed to the top position. In that spot, Otting will be able to help the Trump administration dial back more post-crisis bank regulations. The Federal Reserve raised rates three times this year. With trepidation that more or larger hikes would cause a market meltdown (because cheap money has lifted banks and markets over the past decade), each time the Fed acted, it did so by the smallest sliver it could—25 basis points. All told, this brings the total rate hikes of 2017 to 75 basis points. The short-term interest rate now sits in a 1.25 percent to 1.5 percent range. As part of its rate-hike-into-strength message, the Fed forecast that the job market and economy will further improve in 2018. Trump’s appointed Fed leader, Janet Yellen’s No. 2 man, Jerome Powell, will take stewardship of the Fed in February 2018. Policywise, he will do exactly what Yellen and Ben Bernanke did before him, given that’s how all his votes went—albeit while advocating less oversight of the big banks. That’s because cheap money turbo-boosts the stock market, and quick rate hikes can harm the bond markets. The reality is that the Fed and the administration are scared that selling too many bonds back into the capital markets will result in broader sell-offs, which could lead to another credit squeeze and possible recession, not to mention losses for the big banks exposed to those corporations. Fueled by cheap Fed money and low rates, the amount of outstanding corporate debt has nearly doubled from pre-crisis levels of $3.4 trillion to record levels of $6.4 trillion. By Oct. 1, U.S. investment-grade corporate debt issuance had already surpassed $1 trillion—beating 2016’s pace by three weeks. The amount of speculative-grade (or junkier) corporate debt issued during the first three quarters of 2017 was 17 percent higher than over the same period in 2016. Altogether, that means that U.S. corporate issuance is set for another record year, as well as the sixth consecutive year of increased corporate debt issuance. Corporate debt of nonfinancial U.S. companies as a percentage of GDP has surged before each of the last three recessions. This year, it reached 2007 pre-crisis levels. That didn’t end well last time. Plus, now, that debt has been powered by central banks the world over. And whereas, in the past, companies used some of their debt to invest in real growth, this time corporate investment has remained relatively low. 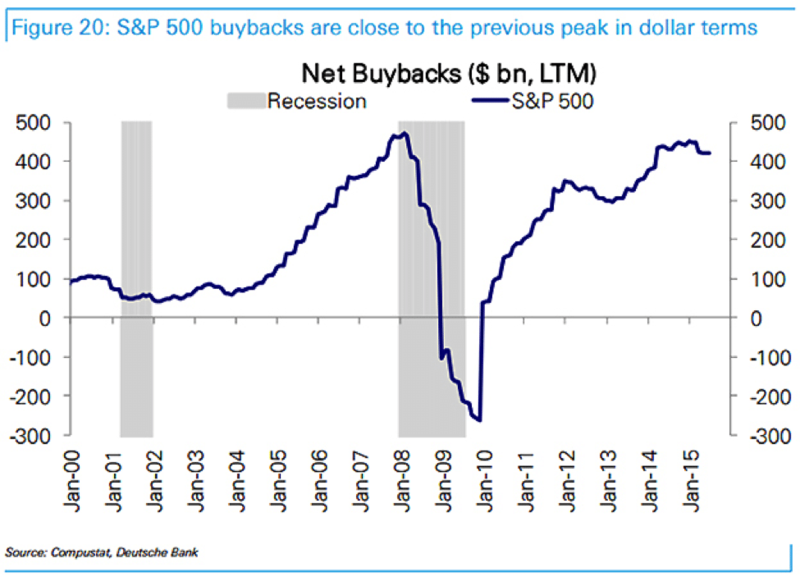 Instead, companies have been on a spree of buying their own stock, establishing a return to 2007-level stock buybacks. Companies have taken advantage of cheap money to increase their debt and buy their own stock, even though Trump and the GOP peddled the notion that decreasing their tax rate by a whopping 40 percent would move them toward diverting their money from the stock and bond markets into jobs and wages. The GOP tax bill cuts the corporate tax rate from 35 percent to 21 percent. Collectively, large U.S. companies only pay an average effective tax rate of 18 percent anyway. They only contribute 9 percent to the overall tax receiptsthe U.S. government receives each year. Companies like General Electric haven’t paid any taxes in a decade. But more to the point, that tax cut is another form of cheap money giveaway. Even Jamie Dimon, chairman and CEO of JPMorgan Chase, concurred. He called the tax cut a “QE4” (another round of quantitative easing, added to the three rounds the Fed executed over the past decade to reach $4.41 trillion in credit). As we enter the new year, consider this: All the Fed talk about “tapering” or reducing the size of its book, and even the 75 basis points of rate hikes, are a setup for the next act of the same play. Since the Fed’s announcement that it was going to stop reinvesting the interest payments on the bonds it’s holding, the size of its book has been about the same. There’s always a mismatch between what the Fed says and what it does. So despite its tapering talk, the Fed’s balance sheet is down a mere $10 billion (an equivalent of a rounding error) this year. Its book of assets remains at $4.41 trillion, a figure equivalent to 23 percent of U.S. GDP. Incoming Fed Chair Powell is more likely to keep supplying cheap money than withdrawing it from the markets in the instance of any wobbles. What does that mean? Financially speaking, 2018 will be a precarious year of more bubbles inflated by cheap money, followed by a leakage that will begin with the bond or debt markets. The GOP tax cuts won’t technically kick in monetarily for corporations until after the year is over in 2019, but the anticipation of extra funds will fuel more buybacks. This will help to provide cover for any rate hikes the Fed implements, because it provides corporations the ability to boost their own share prices further. Meanwhile, the Treasury Department, Federal Reserve and other smaller regulatory authorities in Washington will push for greater deregulation of the financial systems and banking industry on any level possible. If there is another financial crisis in 2018 or later, it will be worse than the last one because the system remains fundamentally unreformed, banks remain too big to fail and the Fed and other central banks continue to control the flow of funds to these banks (and through to the markets) by maintaining a cheap cost of funds. Politically, no one in any position of power will do anything to fix any of this.